Issue Based Information System (IBIS) is a notation invented by Horst Rittel and Werner Kunz in the early 1970s. IBIS is best known for its use in dialogue mapping, a collaborative approach to tackling wicked problems (i.e. contentious issues) in organisations. It has a range of other applications as well – capturing knowledge is a good example, and I’ll have much more to say about that later in this post. Over the last five years or so, I have written a fair bit on IBIS on this blog and in a book that I co-authored with the dialogue mapping expert, Paul Culmsee. The present post reprises an article I wrote five years ago on the “what” and “whence” of the notation: its practical aspects – notation, grammar etc -, as well as its origins, advantages and limitations. My motivations for revisiting the piece are to revise and update the original discussion and, more important, to cover some recent developments in IBIS technology that open up interesting possibilities in the area of knowledge management. To appreciate the power of the IBIS, it is best to begin by understanding the context in which the notation was invented. I’ll therefore start with a discussion of the origins of the notation followed by an introduction to it. Finally, I’ll cover its development through the last 40 odd years, focusing on the recent developments that I mentioned above. Issue-Based Information Systems (IBIS) are meant to support coordination and planning of political decision processes. IBIS guides the identification, structuring, and settling of issues raised by problem-solving groups, and provides information pertinent to the discourse. The problems tackled by such cooperatives are paradigm-defining examples of wicked problems. From the start, then, IBIS was intended as a tool to facilitate a collaborative approach to solving…or better, managing a wicked problem by helping develop a shared perspective on it. 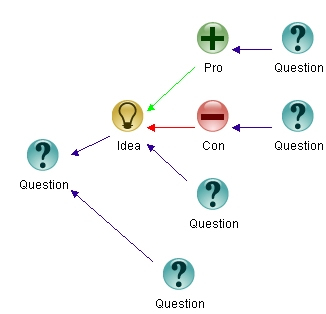 In Compendium, the IBIS elements described above are represented as nodes as shown in Figure 1: issues are represented by blue-green question marks; positions by yellow light bulbs; pros by green + signs and cons by red – signs. Compendium supports a few other node types, but these are not part of the core IBIS notation. Nodes can be linked only in ways specified by the IBIS grammar as I discuss next. Yes, it’s as simple as that. See this postfor a simple example of dialogue mapping. See this postor this one for examples of argument visualisation. (Note: using IBIS to map out the structure of written arguments is called issue mapping. See this one for an example Paul did with his children. This example also features in our book. that made an appearance in our book. Now that we know how IBIS works and have seen a few examples of it in action, it’s time to trace the history of the notation from its early days the present. When Rittel and Kunz wrote their paper, there were three IBIS-type systems in operation: two in government agencies (in the US, one presumes) and one in a university environment (quite possibly Berkeley, where Rittel worked). Although it seems quaint and old-fashioned now, it is no surprise that these were manual, paper-based systems; the effort and expense involved in computerizing such systems in the early 70s would have been prohibitive and the pay-off questionable. An initially unstructured problem area or topic denotes the task named by a “trigger phrase” (“Urban Renewal in Baltimore,” “The War,” “Tax Reform”). About this topic and its subtopics a discourse develops. Issues are brought up and disputed because different positions (Rittel’s word for ideas or responses) are assumed. 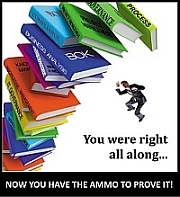 Arguments are constructed in defense of or against the different positions until the issue is settled by convincing the opponents or decided by a formal decision procedure. Frequently questions of fact are directed to experts or fed into a documentation system. Answers obtained can be questioned and turned into issues. Through this counterplay of questioning and arguing, the participants form and exert their judgments incessantly, developing more structured pictures of the problem and its solutions. It is not possible to separate “understanding the problem” as a phase from “information” or “solution” since every formulation of the problem is also a statement about a potential solution. Even today, forty years later, this is an excellent description of how IBIS is used to facilitate a common understanding of complex problems. Moreover, the process of reaching a shared understanding (whether using IBIS or not) is one of the key ways in which knowledge is created within organizations. 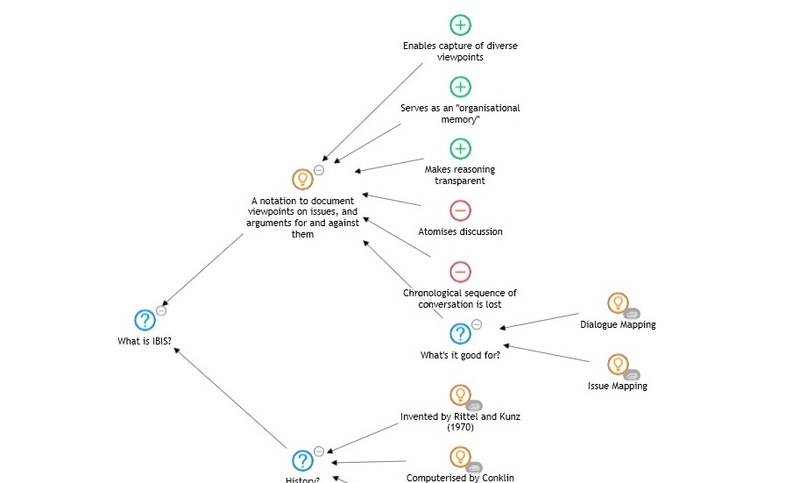 To foreshadow a point I will elaborate on later, using IBIS to capture the key issues, ideas and arguments, and the connections between them, results in a navigable map of the knowledge that is generated in a discussion. In a paper published in 1988 entitled, gIBIS: A hypertext tool for exploratory policy discussion, Conklin and Begeman describe a prototype of a graphical, hypertext-based IBIS-type system (called gIBIS) and its use in capturing design rationale (yes, despite the title of the paper, it is more about capturing design rationale than policy discussions). The development of gIBIS represents a key step between the original Rittel-Kunz version of IBIS and its more recent version as implemented in Compendium. Amongst other things, IBIS was finally off paper and on to disk, opening up a world of new possibilities. The ability to capture design rationale – the options discussed (including the ones rejected) and the discussion around the pros and cons of each. A platform for promoting computer-mediated collaborativedesign work – ideally in situations where participants were located at sites remote from each other. The ability to store a large amount of information and to be able to navigate through it in an intuitive way. The gIBIS prototype proved successful enough to catalyse the development of Questmap, a commercially available software tool that supported IBIS. In a recent conversation Jeff Conklin mentioned to me that Questmap was one of the earliest Windows-based groupware tools available on the market…and it won a best-of-show award in that category. It is interesting to note that in contrast to Questmap (which no longer exists), Compendium is a single-user, desktop software. The primary application of Questmap was in the area of sensemaking which is all about helping groups reach a collective understanding of complex situations that might otherwise lead them into tense or adversarial conditions. Indeed, that is precisely how Rittel and Kunz intended IBIS to be used. 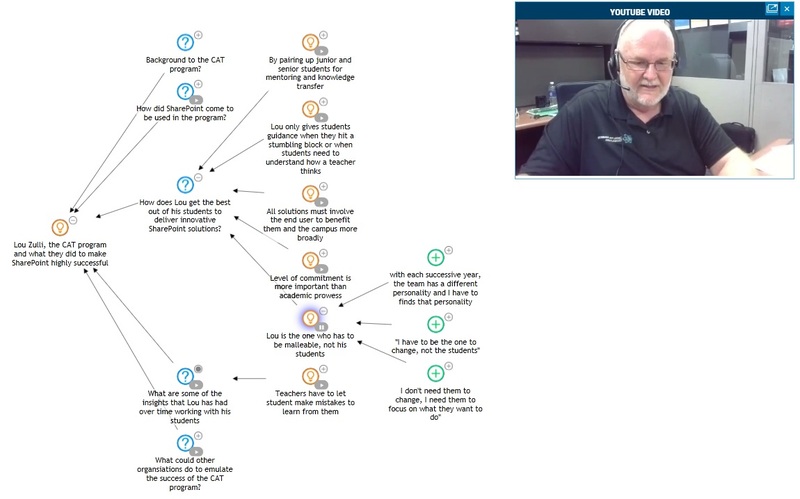 The key advantage offered by computerized IBIS systems was that one could map dialogues in real-time, with the map representing the points raised in the conversation along with their logical connections. This proved to be a big step forward in the use of IBIS to help groups achieve a shared understanding of complex issues. That said, although there were some notable early successes in the real-time use of IBIS in industry environments (see this paper, for example), these were not accompanied by widespread adoption of the technique. It is worth exploring the reasons for this briefly. For acceptance, any system must offer immediate value to the person who is using it. Quoting from the paper, “No designer can be expected to altruistically enter quality design rationale solely for the possible benefit of a possibly unknown person at an unknown point in the future for an unknown task. There must be immediate value.” Such immediate value is not obvious to novice users of IBIS-type systems. There is some effort involved in gaining fluency in the use of IBIS-based software tools. It is only after this that users can gain an appreciation of the value of such tools in overcoming the limitations of mapping design arguments on paper, whiteboards etc. Teasing out issues, ideas and arguments from the dialogue. Classifying points raised into issues, ideas and arguments. Naming (or describing) the point succinctly. Developing a sense for conversational patterns. Expertise in these skills can only be developed through sustained practice, so it is no surprise that beginners find it hard to use IBIS to map dialogues. Indeed, the use of IBIS for real-time conversation mapping is a tacit skill, much like riding a bike or swimming – it can only be mastered by doing. IBIS can bridge the gap between discussions and records of discussions (minutes, audio/video transcriptions etc.). IBIS sits between the two, acting as a short-term memory. The paper thus foreshadows the use of issue-based systems as an aid to organizational or project memory. Many elements (issues, ideas or arguments) that come up in a discussion have contextual meanings that are different from any pre-existing definitions. That is, the interpretation of points made or questions raised depends on the circumstances surrounding the discussion. What is more important is that contextual meaning is more important than formal meaning. IBIS captures the former in a very clear way – for example a response to a question “What do we mean by X?” elicits the meaning of X in the context of the discussion, which is then subsequently captured as an idea (position)”. I’ll have much more to say about this towards the end of this article. The reasoning used in discussions is made transparent, as is the supporting (or opposing) evidence. The state of the argument (discussion) at any time can be inferred at a glance (unlike the case in written records). See this post for more on the advantages of visual documentation over prose. Often times it happens that the commonality of issues with other, similar issues might be more important than its precise meaning. To quote from the paper, “…the description of the subject matter in terms of librarians or documentalists (sic) may be less significant than the similarity of an issue with issues dealt with previously and the information used in their treatment…” This is less of an issue now because of search of technologies. However, search technologies are still largely based on keywords rather than context. A properly structured, context-searchable IBIS-based archive would be more useful than a conventional document-based system. As I’ll discuss in the next section, the technology for this is now available. To sum up, then: although IBIS offers a means to map out arguments what is lacking is the ability to make these maps available and searchable across an organization. It is interesting to note that Compendium, unlike its predecessor, Questmap, is a single-user, desktop tool – it does not, by itself, enable the sharing of maps across the enterprise. To be sure, it is possible work around this limitation but the workarounds are somewhat clunky. A recent advance in IBIS technology addresses this issue rather elegantly: Seven Sigma, an Australian consultancy founded by Paul Culmsee, Chris Tomich and Peter Chow, has developed Glyma (pronounced “glimmer”): a product that makes IBIS available on collaboration platforms like Microsoft SharePoint. This is a game-changer because it enables sharing and searching of IBIS maps across the enterprise. Moreover, as we shall see below, the implications of this go beyond sharing and search. Full Disclosure: As regular readers of this blog know, Paul is a good friend and we have jointly written a book and a few papers. However, at the time of writing, I have no commercial association with Seven Sigma. My comments below are based on playing with beta version of the product that Paul was kind enough to give me to access to as well as some discussions that I have had with him. The look and feel of Glyma is much the same as Compendium (see Fig 3 above) – and the keystrokes and shortcuts are quite similar. I have trialled Glyma for a few weeks and feel that the overall experience is actually a bit better than in Compendium. For example one can navigate through a series of maps and sub-maps using a breadcrumb trail. Another example: documents and videos are embedded within the map – so one does not need to leave the map in order to view tagged media (unless of course one wants to see it at a higher resolution). I won’t go into any detail about product features etc. since that kind of information is best accessed at source – i.e. the product website and documentation. Instead, I will now focus on how Glyma addresses a longstanding gap in knowledge management systems. In most organisations, knowledge artefacts (such as documents and audio-visual media) are stored in hierarchical or relational structures (for example, a folder within a directory structure or a relational database). To be sure, stored artefacts are often tagged with metadata indicating when, where and by whom they were created, but experience tells me that such metadata is not as useful as it should be. The problem is that the context in which an artefact was created is typically not captured. Anyone who has read a document and wondered, “What on earth were the authors thinking when they wrote this?” has encountered the problem of missing context. Context, though hard to capture, is critically important in understanding the content of a knowledge artefact. Any artefact, when accessed without an appreciation of the context in which it was created is liable to be misinterpreted or only partially understood. Glyma addresses the issue of context rather elegantly at the level of the enterprise. I’ll illustrate this point an inspiring case study on the innovative use of SharePoint in education that Paul has written about some time ago. Students want to make a difference! Give them the right project and they do incredible things. Make the project meaningful. Let it serve a purpose for the campus community. Learn to listen. If your students have a better way, do it. If they have an idea, let them explore it. Invest in success early. Make sure you have the infrastructure to guarantee uptime and have a development farm. In brief: these points highlight the fact that Lou’s primary role as director of the center is to create the conditions that make it possible for students to do great work. The commercial-level quality of work turned out by students suggests that Lou’s knowledge on how to build high-performing teams is definitely worth capturing. The question is: what’s the best way to do this (short of getting him to visit you and talk about his experiences)? Paul recently interviewed Lou with the intent of documenting Lou’s experiences. The conversation was recorded on video and then “Glymafied” it – i.e the video was mapped using IBIS (see Figure 4 below). The content of the entire conversation is mapped out so one can “see” the conversation at a glance. The context in which a particular point (i.e. the content of a node) is made is clarified by the connections between a node and its neighbours. Moving left from a node gives a higher level picture, moving right drills down into details. Relevant documents or audio visual media can be tagged to specific nodes to provide supplementary material. In this case the video recording was tagged to specific nodes that related to points made in the video. Clicking on the play icon attached to such a node plays the segment in which the content of the node is being discussed. This is a really nice feature as it saves the user from having to watch the whole video (or play an extended game of ffwd-rew to get to the point of interest). Moreover, this provides additional context that cannot (or is not) captured by in the map. 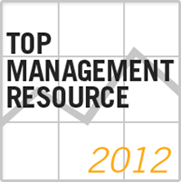 For example, one can attach papers, links to web pages, Slideshare presentations etc. to fill in background and context. Glyma is integrated with an enterprise content management system by design. One can therefore link map and video content to the powerful built-in search and content aggregation features of these systems. For example, users would be able enter a search from their intranet home page and retrieve not only traditional content such as documents, but also stories, reflections and anecdotes from experts such as Lou. Another critical aspect to intranet integration is the ability to provide maps as contextual navigation. Amazon’s ability to sell books that people never intended to buy is an example of the power of such navigation. The ability to execute the kinds of queries outlined in the previous point, along with contextual information such as user profile details, previous activity on the intranet and the area of an intranet the user is browsing, makes it possible to present recommendations of nodes or maps that may be of potential interest to users. Such targeted recommendations might encourage users to explore video (and other rich media) content. Technical Aside: An interesting under-the-hood feature of Glyma is that it uses an implementation of a hypergraph database to store maps. (Note: this is a database that can store representations of graphs (maps) in which an edge can connect to more than 2 vertices). These databases enable the storing of very general graph structures. What this means is that Glyma can be extended to store any kind of map (Mind Maps, Concept Maps, Argument Maps or whatever)…and nodes can be shared across maps. This feature has not been developed as yet, but I mention it because it offers some exciting possibilities in the future. To summarise: since Glyma stores all its data in an enterprise-class database, maps can be made available across an organization. It offers the ability to tag nodes with pretty much any kind of media (documents, audio/video clips etc. ), and one can tag specific parts of the media that are relevant to the content of the node (a snippet of a video, for example). Moreover, the sophisticated search capabilities of the platform enable context aware search. Specifically, we can search for nodes by keywords or tags, and once a node of interest is located, we can also view the map(s) in which it appears. The map(s) inform us of the context(s) relating to the node. The ability to display the “contextual environment” of a piece of information is what makes Glyma really interesting. In metaphorical terms, Glyma enables us to see the forest for the trees. My aim in this post has been to introduce readers to the IBIS notation and trace its history from its origins in issue mapping to recent developments in knowledge management. The history of a technique is valuable because it gives insight into the rationale behind its creation, which leads to a better understanding of the different ways in which it can be used. Indeed, it would not be an exaggeration to say that the knowledge management applications discussed above are but an extension of Rittel’s original reasons for inventing IBIS. Firstly, the real surprise for me has been that the technique can capture most written arguments and conversations, despite having only three distinct elements and a very simple grammar. Yes, it does require some thought to do this, particularly when mapping discussions in real time. However, this cognitive overhead is good because it forces the mapper to think about what’s being said instead of just writing it down blind. Thoughtful transcription is the aim of the game. When done right, this results in a map that truly reflects an understanding of a complex issue. Secondly, although most current discussions of IBIS focus on its applications in dialogue mapping, it has a more important role to play in mapping organizational knowledge. Maps offer a powerful means to navigate the complex network of knowledge within an organisation. The (aspirational) end-goal of such an effort would be a “global” knowledge map that highlights interconnections between different kinds of knowledge that exists within an organization. To be sure, such a map will make little sense to the human eye, but powerful search capabilities could make it navigable. To the extent that this is a feasible direction, I foresee IBIS becoming an important skill in the repertoire of knowledge management professionals. Reblogged this on CHDS Blog.